Area pet owners will soon have a new dog park, the first for Hiawatha, to visit with their furry friends. 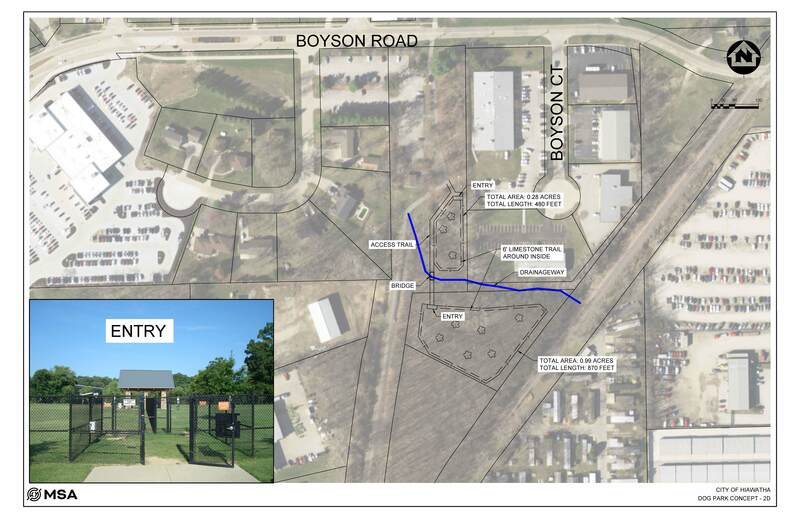 The roughly 2-acre park will be located just south of Boyson Road along the Cedar Valley Nature Trail. It came together thanks to agreements between the City, Linn County and nearby Dave Wright Auto. The collaborative efforts have helped not only provide the city with its first dog park, but keep costs low. When Dave Wright heard a dog park was the No. 1 amenity the citizens of Hiawatha wanted (based off the Hiawatha Citizen Survey 2016), he thought what a perfect opportunity to give back to the communities that support us and the Subaru mission. Dave discussed the project idea with the City, and from there it snowballed down to a real opportunity, that weather dependent, have completed by the end of the year (2019). If you have any specific questions please contact Kelly Willadsen, Parks and Recreation Director at kwilladsen@hiawatha-iowa.com or 319-393-1515.